Space Safety » Archive » Space Hazards » Asteroids and Comets » What if an Asteroid Was About to Hit Earth? Sci-fi movies that depict Earth’s near destruction from incoming asteroids like Armageddon or Deep Impact are seen as “scary entertainment” far from reality. After all, the giant asteroid that wiped out the dinosaurs was 66 million years ago. Most people think if there is something like this to worry about it is safely millions of years away. Unfortunately this is faulty logic for several reasons. First we have recently found that asteroid strikes on Earth are 4 to 10 times more likely that we thought just a decade ago. Secondly, we now have many more people that 10 or 20 years ago. These are concentrated in cities and dependent on modern infrastructure, so a single asteroid hit of just modest size could kill millions and make tens of millions suddenly vulnerable. We will soon have 50 mega-cities of over 10 million people and global population could hit anywhere from 10 to 12 billion by 2100). Thirdly, we have to protect against not only a “ten” on the Torino Impact Hazard Scale — such as the K-T event that wiped out 80% of all species on Earth — but also something like a “6” or above strike that could still wipe out a mega-city and do enormous damage. The asteroid that hit the Siberian city of Chelyabinsk in February 15, 2013 was totally unexpected. This object traveled at 67,000 km/hr, had a mass of 13,000 metric tons, was 20 meters in diameter and possessed kinetic energy equivalent to 20 Hiroshima-like atomic bombs. Fortunately it randomly hit a very sparsely populated area. The Tunguska asteroid strike of 1908 — about 40 meters in size — if it had hit New York would have obliterated its population and vital infrastructure. The first step to protect ourselves is therefore detection, tracking and risk assessment. This video compilation of the shockwave effects of the Chelyabinsk meteor put the idea that space hazards are just remote and unlikely events in perspective. The United Nations, at the urging of astronauts, scientists, and COPUOS, in December 2013, set up the first stages of a planetary defense system. Sir Arthur C. Clarke in his Sci-Fi book Rendezvous with Rama envisioned Earth getting around to this in 2077! We now seem to be 64 years ahead of schedule, but there is still a long ways to go. The UN action was to authorize the creation of an International Asteroid Warning Network (IAWN) to assist with a coordinated global warning system. The General Assembly perhaps even more importantly moved to create a Space Mission Planning Advisory Group (SMPAG) that would devise a defensive response once a serious threat was detected. Right now, the most urgent action is to create a reliable detection and tracking system that allows early warning. If we detect a threat from an asteroid or comet decades ahead of time, then there are lower cost and high effective means to deflect the orbit away from Earth. This is the good news. The bad news is that our detection systems, according to the Planetary Society, the B612 Foundation and a number of noted scientists, is woefully inadequate. When NASA and the U.S. Congress first took asteroid strikes seriously, they instructed the US Space Agency to find all asteroids 1 kilometer in diameter. Then after a while in 2005 Congress passed the George Brown Jr. Near Earth Survey Act that required NASA to find all NEO asteroids down to 140 meters in diameter and to provide an annual progress report on this survey as well as protective strategies. The B612 Foundation, led first by Astronauts Rusty Schweickart and now Astronaut Ed Lu, has explained the 140 meter standard is woefully inadequate. They content that between 500K and a million “killer asteroids,” 30 meters or more in diameter, what might be called a Tunguska class space rock, can wipe out a major city like New York, Washington, DC., London, Tokyo, Mexico City or Beijing. They contend that only an infrared space telescope like their Sentinel project can detect the hundreds of thousands of potentially hazards NEOS under 140 meters in diameter that are still essentially unknown. Effective countermeasures depend on how much advance warning we have. If we know of a likely major hit decades in advance, then we could send an intercept mission well ahead of time to divert the threatening asteroid to a harmless orbit. This could be simply a gravitational attractor that just by being close by could create a new diversion orbit. The Planetary Society currently has a mission called “Laser bees” that will test the idea of a spacecraft with small very high temperature lasers that would heat an asteroid surface to create jets composed of bits of the asteroid to gently propel the asteroid into a safer orbit. One could also have a spacecraft that could shoot a harpoon into an asteroid that would allow an ion engine thruster to maneuver the asteroid into a new orbit that might eventually allow capture by the Sun’s orbit or some other planetary body. There are also more forceful technologies. These might involve directed energy beams such as Prof. Philip Lubin of the University of California is currently developing. Prof. Lubin suggests that this technology could be tested by removing harmful space debris from Earth orbit to verify its effectiveness. Of course if the danger is more immediate such as only a year away, then the countermeasures become more limited. This might come down to use of a targeted nuclear device, or a very high powered directed energy beam system with much greater force and heat than has yet been developed. There are also more exotic concepts, at least be considered by NASA and other space agencies. These include such as possibilities as capturing an asteroid and parking it in lunar orbit so that it could be used to intercept killer asteroid or comet or having a fleet of robots—possibly armed with explosives—that could ram into a threatening Near Earth Orbit. The largest challenge of all would likely be comet that was on collision course with Earth. As we know from the Rosetta mission it takes years to maneuver a spacecraft, through gravitational slingshot assists, to build up enough velocity to reach and land on a comet that may moving at 200,000 kilometer an hour or more. Thus early detection of a threatening comet streaking in from the Oort Cloud region from beyond the reaches of the solar system is the most difficult task we now face in terms of early cosmic hazard alerts. 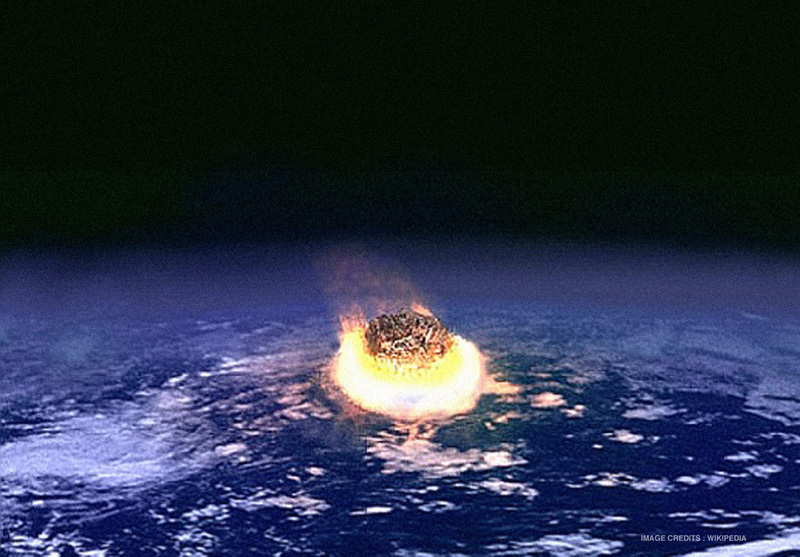 Artist’s impression of an asteroid impact event. The collision with an asteroid a few kilometers in diameter may release as much energy as the simultaneous detonation of several million nuclear weapons. – Credits: NASA. Clearly there are significant technical challenges to try to devise viable and proven space systems that could divert an asteroid or comet into a new orbit that would avoid a collision with Earth. The European Space Agency and the German Space Agency (DLR) have started research efforts to study the composition of asteroids and protective strategies, but these have very limited budgets. NASA is currently spending the most of any space agency in this area, but no space agency has NEO defense identified as a top strategic goal. It could well be that space law issues could prove to a major challenge to any effective planetary defense strategy. The Outer Space Treaty of 1967 that is ratified by many nations and all space-faring nations that would likely mount a planetary defense mission are currently not allowed to launch “space weapons”, yet almost any spacecraft that could actually carry out such an NEO defense action would likely be considered to be such a space weapon. Further the Liability Convention that entered into force in 1972 constitutes another problem. If any planetary defense mission were to alter the orbit or break apart an asteroid so that it created damage to any nation, the “launching nation” would be considered liable for all damages, even if the mission successfully prevented even greater damage elsewhere—even in the injured country. The need for some sort of “special exception” regarding “space weapons” and “liability claims”, when it comes to planetary defense, seems to a part of what the UN General Assembly now needs to consider. A Space Generation-sponsored documentary about Near Earth Objects and Planetary Defense. Presumably all humans would like to save our planet, all flora and fauna that lives on our small Earth, and to be able to mount a planetary defense if a true threat from a cosmic hazard were identified. We have just made a good start. The B612 Foundation’s Sentinel Infrared Telescope, NASA’s NEOCam program, other space agency initiatives and ground observatories are a reasonable start in detecting potentially hazardous NEOs, but have still quite far to go. Better detection and tracking, better defensive technologies, and better space law provisions are clearly needed. Probably only a real tangible threat from a “killer asteroid”, will likely spur us to vibrant action.